I’d hate to ruin something as splendidly thoughtless as butter for anyone reading this post, but Land O Lake’s label–a long-standing household image–is loaded with just as much meaning as cholesterol. 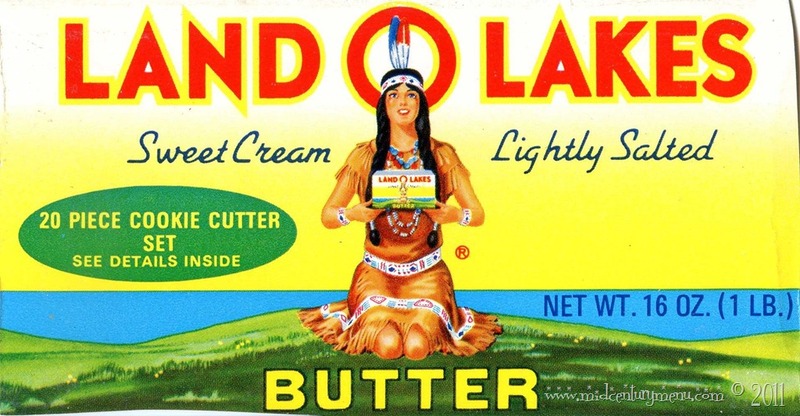 Beneath the Land O Lakes text, a smiling Native American woman holds another Land O Lakes box of butter in her hands. Behind her, the “O” in “Land O Lakes” surrounds her head from the exact center of the picture’s rectangular borders—creating a halo around her head. These elements in particular ring of Sean Hall’s book, This Means This, This Means That, wherein he explains the relationship between signifiers and what is signified. The signified, in this case, is the “O” in Land O Lakes”, signifying a vague sort of divinity. From here, the divinity trickles from the halo, to the Native American woman (the bearer of the halo), to the product she is offering. Just as important to the significations is the woman’s—and, furthermore, the box’s—placement(s) in this label. Notice that not only is she front and center with the box, all the objects surrounding her in the margin—the hills, the horizon—intensify her centricity; the hills to both of her sides are symmetrically-placed while the horizon makes a line straight through the middle region of her body. This element of placement adds yet another layer of religiosity to Land O Lakes’ product, drawing on Christian art works like Da Vinci’s “The Last Supper” or murals inside of old churches. So what is the purpose of placing a Native American woman in a Christian context when trying to sell your product? For starters, America is a primarily Christian nation, so using religious aesthetics to tap into our senses of purity and wholesomeness can’t hurt. I’m a lot more interested in the fact that this woman is Native American, though. Perhaps the creators of this label were tapping into another context—our nation’s considerably ugly formation over the Native Americans—and purifying it through Christianity. The woman in the label is sitting before a yellow, butter-like American sky and happily offering us Land O Lakes butter with a Christ-like halo. 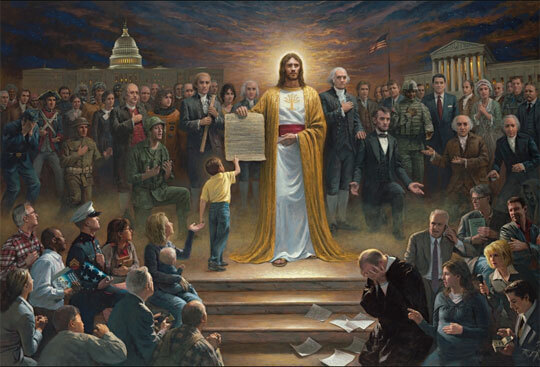 In the controversial painting by Jon McNaughton, “One Nation Under God”, we see the same placement of divinity—this time Jesus—at the center of the work with the same central placement and same idealization (a glowing aura around his head). And, just like the Land O Lakes woman, he is offering us something: the Constitution. In both paintings, the artists are offering us forgiveness by fusing the divine with America, ultimately offering us forgiveness through what they are selling: dairy products and political agendas.